From vegan food and a new downtown grocery store to speakeasy-style cocktails and a coffee shop working with farmers in Honduras, the restaurants, cafes and other culinary businesses debuting in Muskegon in 2019 are a wide-ranging group focused on bringing new flavors to the region’s palate and further expanding a quickly growing city. 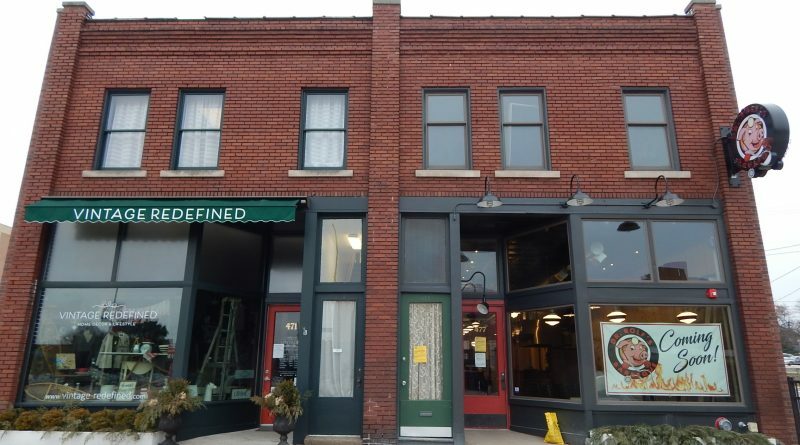 Eight years after selling their first cup of joe at the Muskegon Farmers Market in 2011, Aldea Coffee is set to open a cafe at downtown’s NorthTown 794 development (794 Pine St.) this year. ‘Aldea’ means ‘community’ or ‘village’ in Spanish—and it’s that idea of connecting people that’s driving the team of people behind the business that offers ethically sourced coffee, house-made syrups, baked goods from Laughing Tree Brick Oven Bakery, organic loose-leaf teas, and more. Launched as a nonprofit—Aldea Development—in 2009, Aldea debuted its first cafe at the century-old armory building in Grand Haven in 2015. A community-driven development organization that works to empower the farmers and families of La Unión, Lempira, Honduras through microloans, market access, community partnership projects, and more, the nonprofit partners with Honduran farmers to bring their coffee to West Michigan. Here, the coffee is roasted in Muskegon Heights and sold throughout the region. The folks behind Aldea have “always had a desire to open a space in Muskegon,” Boyd, Goode and Bollweg wrote to us. Andrew Boyd and Jeremy Miller are the owners of Aldea Coffee, and the full-time team consists of Josh Manzer, Angie Stone, Elly Bollweg, Daniel Bollweg, and Brittany Goode. In addition to coffees, teas, locally-made cookies and scones, and an evolving food menu, Aldea will continue its efforts centered on sustainability in Muskegon. Boyd, Goode and Bollweg told us they’ve made becoming a zero-waste coffee shop a top priority. 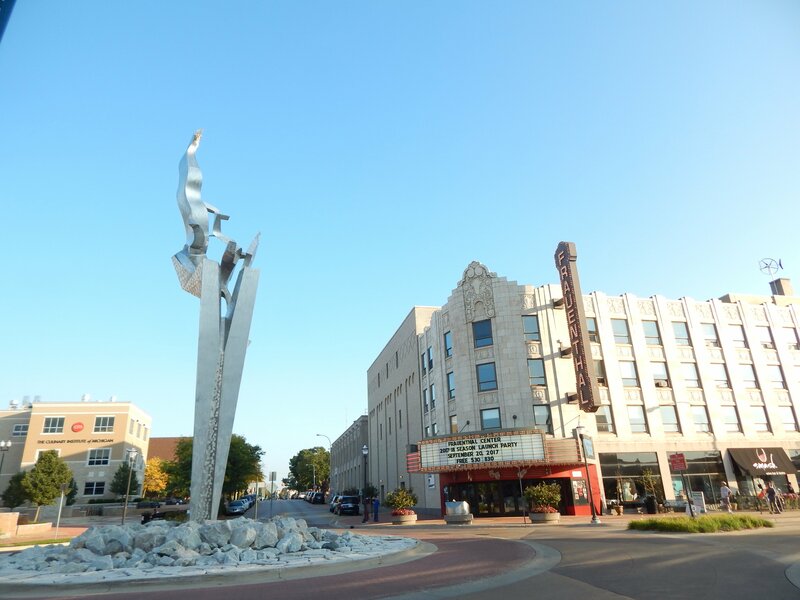 “We made tremendous progress toward this goal through working with local organizations, customers, and the city of Grand Haven, and look forward to seeing what this piece looks like with the cities of Muskegon and Muskegon Heights this year,” the three wrote. The shop will be located on the first floor of the HighPoint Flats apartment building at 285 W. Western Ave. in downtown Muskegon, and it will offer a wide range of goods: think everything from deli sandwiches and poke (a popular Hawaiian seafood dish) to local craft beers and Michigan wines. And, of course, standard grocery items, from milk and cheese to bathroom necessities. Plus, shoppers will be able to pick out organic goods and even get curbside delivery when they drive up to the shop. In addition to the first-floor space, Precious owns a portion of the basement below, including an old bank vault that was part of the Hackley Union Bank building—which, when it opened in 1918, was celebrated as Muskegon’s first skyscraper. From this space, Precious plans on holding tastings and other events. Eventually, she’d like to operate a speakeasy in the basement. For those interested in weighing in on the kinds of goods they’d like to see sold at Boomtown, Precious is asking individuals to participate in a survey on her website. You can click here to see the survey. Also housed in the incoming NorthTown 794 development (794 Pine St.) in downtown’s north side, Capone’s Speakeasy and Pizzeria will be a nod to all things old world Chicago. The name is, as you probably guessed, a reference to Al Capone—a notorious gangster often referred to as “Scarface” who, during the height of Prohibition, made millions in Chicago with his bootlegging and gambling that dominated the city’s organized crime scene. While there will be less (well, no) bootlegging and gambling in the Muskegon Capone’s, there will be plenty of 1920s Windy City charm: think tin ceilings, cocktails, and, of course, Chicago-style pizza—lots and lots of Chicago-style pizza. And all of this will be in the century-old building at 794 Pine St., formerly the home of Al Perri Furniture, which is owned by Muskegon businessman John Essex and is now undergoing extensive historic renovation work. The historic building and renovation is what drew Jim Noel, who owns Capone’s—as well as Topshelf Pizza & Pub on Apple Avenue and Topshelf Liquor Bar & Pizza in downtown Muskegon—to the space that he says will have a true speakeasy feel. “I looked at the building and thought it was a great place,” Noel said in a previous interview with the Muskegon Times. Alongside deep dish, Sicilian and Neapolitan pizza, Noel said there will be a wide variety of classic drinks featuring top shelf liquor. The expansive 21,000-square-foot NorthTown building will feature three stories of dining, drinking and office space. In addition to Aldea Coffee and Capone’s Speakeasy and Pizzeria, it will be home to Redmon’s Kitchen & Bar and Rake Beer Project. Located across the street from the L.C. Walker Arena at 477 W. Western Ave., Dr. Rolf’s Barbeque is set to celebrate its grand opening soon—very soon. As in, the craft barbeque joint’s owners will open its doors to the public on Saturday, Feb. 9 at 11am. Owned by Rolf and Judy Hissom, the new downtown eatery will feature 1,500 square feet of space to chow down on the barbeque that’s the result of 30 years of cooking experience. A doctor at Mercy Health for the past 25 years, Rolf Hissom and his wife have spent the past 30 years raising five children—and, now, with their youngest in college, the two have a bit of time to open up their dream restaurant. “When not providing medical attention to the community, Dr. Rolf spends his free time in the kitchen with his smokers and cooking up both old and new recipes. He loves trying different things!” Dr. Rolf’s Barbeque writes on its Facebook page. “With their children raised and medical practices well established, Dr. Rolf and Judy are fulfilling a lifelong dream—sharing their joy of cooking, hospitality, and their love of food with all of the Muskegon community,” the restaurant continues. As for the food, their menu includes everything from pulled pork and brisket to a chili flight, dirty tots, sweet potato mash, cornbread waffles, and more. You can see the entire menu by clicking here. A rendering of Nipote’s Italian Kitchen in downtown Muskegon. Image courtesy of Jeff Church. 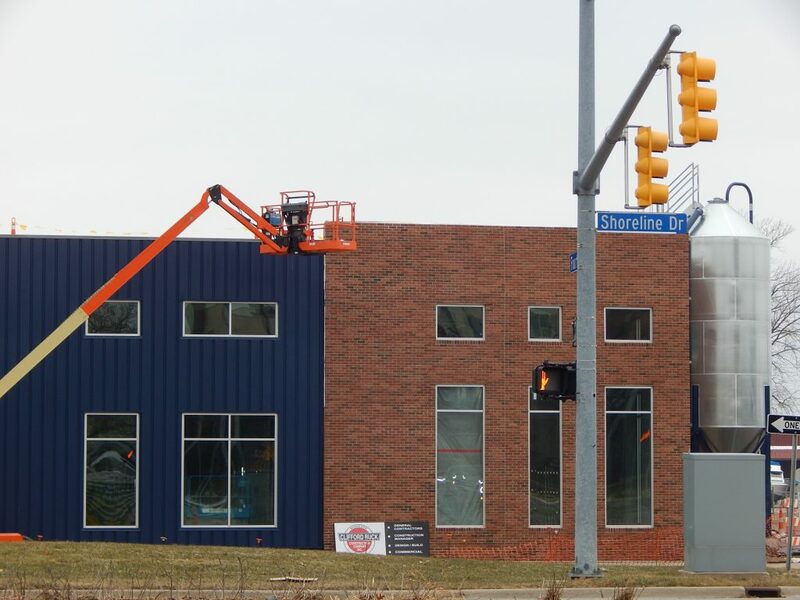 If you’ve been near 98 W. Clay Ave. (Clay Avenue by Pine Street) in downtown Muskegon recently, you’ve no doubt noticed some big changes happening in the space that will soon be home to Nipote’s Italian Kitchen. 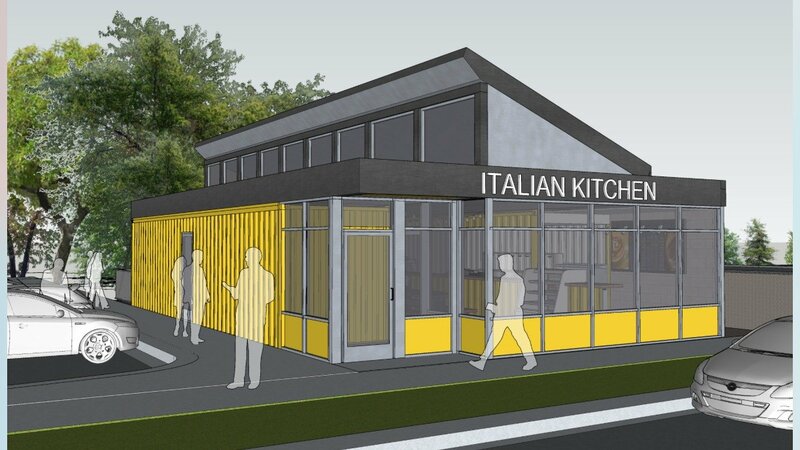 A tent now covers two yellow shipping crates that, likely come April, will be overflowing with authentic Italian and American-inspired dishes crafted to be celebrations of the region’s culinary landscape. Jeff and Shawn Church, the husband-and-wife duo opening Nipote’s (which means ‘nephew’ in Italian), will be offering a seasonal menu that focuses on local: think cheese from The Cheese Lady, vegetables from the Muskegon Farmers’ Market, meat from local farms, and goods from Morat’s Bakery. Plus, there will be wine, espresso, desserts, and more. As for the Nipote’s building, it will be a unique space made from two shipping crates that came from a company out of Detroit, Three Squared. The Italian restaurant will be one of a growing number of eateries around the world built from refashioned shipping containers—including ones in Paris, London, Toronto, Miami, and Sacramento. To follow Nipote’s progress, you can follow them on Facebook and Instagram. 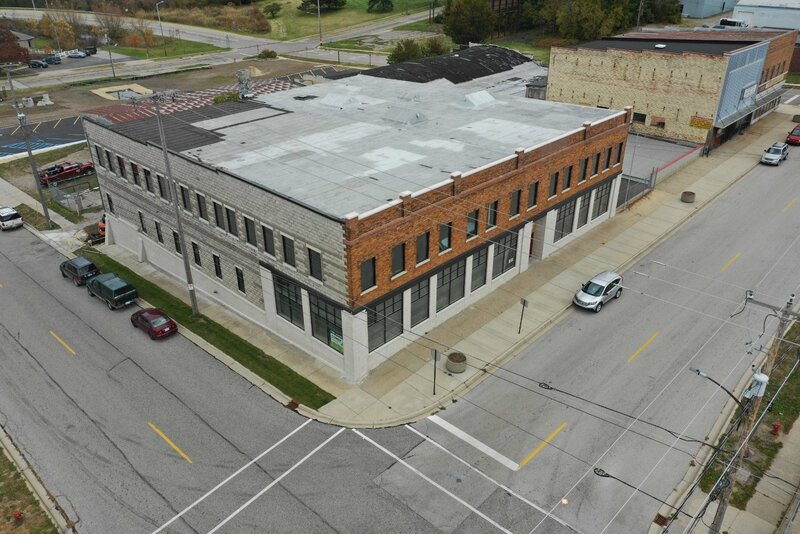 Pigeon Hill Brewing Company’s $2 million, 15,000-square-foot production brewery at 895 Fourth St. in downtown Muskegon is set to soon make many a brew lover happy. As the brewery expands by leaps and bounds (Pigeon Hill beer is now sold in more than 1,000 bars and stores throughout Michigan), the business needs a production facility to help it keep up with demand. At the new location, situated by Fourth Street and Shoreline Drive, there will be space for brewing, packaging, tours, tastings, and more. Perched right by Muskegon Lake and Heritage Landing, the new facility will be situated on a 77,000-square-foot property that the three owners—Michael Brower, Chad Doane, and Joel Kamp—purchased from the city for $98,400. The brewery’s main taproom is expected to stay at 500 W. Western Ave. until 2021, when it is slated to move from the Noble Building to Pigeon Hill’s current 7,000-square-foot brewing site at 441 W. Western Ave.
For the owners, all of this growth comes down to one thing that, to them, is even bigger than their love of beer: Muskegon. If you want to see the progress being made at the production facility, you can check out this video and follow Pigeon Hill on Facebook. When mid to late spring rolls around, beer lovers will be able to raise their glasses to celebrate the opening of Muskegon’s newest craft brewery, Rake Beer Project. Rake too will call downtown’s NorthTown 794 (794 Pine St.) home and will operate in a 6,200-square-foot beer haven—2,250 of which will be used for the taproom and the rest for production space. Plus, it will share a large outdoor garden with Aldea Coffee. Inside, the brewery will be a mix of concrete, wood and black metal in an effort to make it “feel like you’re sitting in the woods when you’re at the bar,” said Rake, who described opening his brewery as a dream come true. Before the official opening, the public will have the chance to taste Rake’s beer. The brewery is offering pilot batches and giving them away outside their soon-to-be home at 794 Pine St. Each pop-up batch will be announced on their Facebook page and Instagram account. With an anticipated debut in late March or April, Redmon’s Kitchen & Bar at NorthTown 794 (794 Pine St.) will be a world where everyone from meat lovers to vegans and vegetarians can happily stuff their faces. A sports bar with an interior dominated by wood, Redmon’s will have a “beautiful, large live edge bar,” according to co-owner Jim Noel. Noel owns the bar with Gary Redmon. As for the food, the eatery will be serving up a wide variety of choices, from gourmet burgers and fresh perch to chicken and waffles, Mexican, vegan and vegetarian dishes, gluten-free options, and more. “We’re excited to be bringing a different selection of food to the downtown,” Noel said in a previous interview. Redmon said he expects the bar will begin hiring within a month; information about applications will be posted on the restaurant’s Facebook page. If you’ve been to the Muskegon Farmers Market over the past half year or so, you hopefully have made your way to The Only Cannoli. Owned by Brittany Meloche and Bethany Bauer, The Only Cannoli has, since beginning to sell their Italian-inspired desserts at the farmers market this past summer, quickly garnered an enthusiastic fan base—and this demand for their sweets is prompting them to soon move into their own brick-and-mortar shop in Muskegon’s Lakeside neighborhood. The Only Cannoli is moving into 1925 Lakeshore Dr., and they’ll soon be operating out of the space that BananaDog Loose Leaf Tea now calls home. BananaDog is moving down the street to the Lakeside Center at 1845 Lakeshore Drive. Currently, the owners—both of whom have relatives from Italy and who have long been devotees of Italian cuisine—are aiming for a March open, when they’ll begin selling their handmade cannolis. The two told us they hope to expand their menu to offer pizzelle and biscotti, as well as other Italian pastries and potentially seasonal specialty breads. If there’s space, the two owners aim to have a small three to four seat window bar, from where the guests can watch the marina just across from the shop. To keep up to date with their Lakeside opening, you can follow The Only Cannoli on Facebook and Instagram.